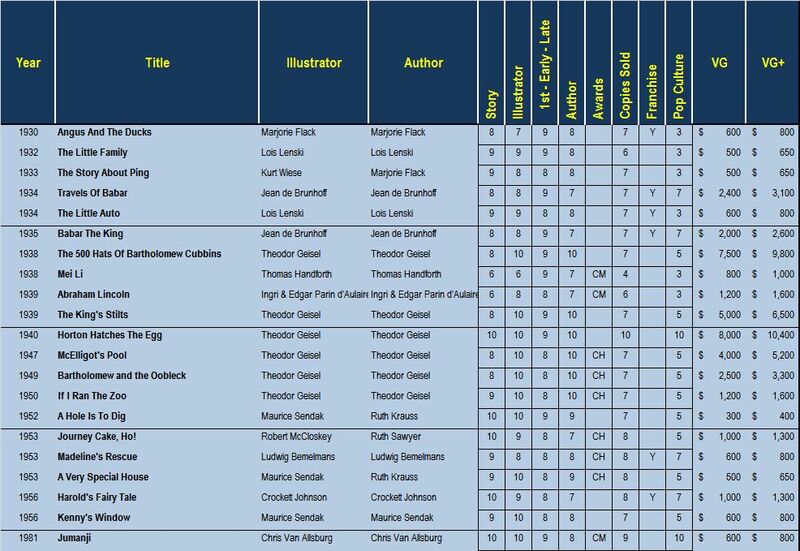 In the previous article the Marquis 25 was selected, the top 25 collectible American picturebooks. Looking back at the list, although some readers might argue whether a book or two belongs in their personal top 25 list, few would quibble with any of the Marquis 25’s inclusion in the Top 100 Collectible American Picturebooks. With the end game in mind, this is good first step: 25 books named, 75 more to go. The next logical step is selecting the books that almost made the Marquis 25. I’ve labeled this next set the ‘Nearly No Brainers’ an homage to their proximity to greatness. The ‘Nearly No Brainers’ have many of the qualities of Marquis 25, however by comparison, did not have all the necessary credentials. The value of several of the ‘Nearly No Brainers’ is higher than several of the Marquis 25. To reiterate, value was not the penultimate attribute for selection in the Marquis 25 or the Top 100 Collectible American Picturebooks. Angus And The Ducks (1930) was the first of five books in the Angus series, written and illustrated by Marjorie Flack. Flack also authored the Story About Ping (1933), however it was illustrated by Kurt Wiese. Since Wiese had previously lived in China for six years, Flack felt his illustrations would lend more authenticity to the story. Wiese was a prolific children’s book illustrator with over 400 books to his credit. He won two Caldecott Honor awards in his, and provided illustrations for the Newbery Medal book Young Fu of the Upper Yangtze however is best know for illustrating Walter Brooks’ Freddy The Pig books. Story About Ping is Wiese’s only book on the Top 100 list. A Hole Is To Dig (1952) is the first of many books authored by Ruth Krauss and illustrated by Maurice Sendak. Krauss was married to Crockett Johnson, the author/illustrator of Harold and the Purple Crayon. The other Sendak book on the ‘Nearly No Brainers’ list is Kenny’s Window (1956) significant since it was the first book he authored. The inclusion of Mei Li (1938) and Abraham Lincoln (1939) was heavily influenced by winning the 2nd and 3rd Caldecott Medals. The Caldecott was also influential on Madeline’s Rescue (1953), the second Madeline book, however the book has other strong merits. Chris Van Allsburg’s Jumanji (1981) made the list, joining his Polar Express (1985) and David Wiesner’s Tuesday as the only books published since 1980 to make the Top 100. Six Dr. Seuss books made the list of ‘Nearly No Brainers’. 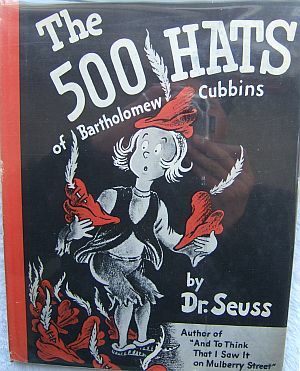 Seuss first editions are highly collectible and have corresponding high market value. While three of the Seuss books won Caldecott Honor awards, winning the awards has little or no impact on the value of the first editions. Some might be surprised to learn Dr. Seuss never won the Caldecott Medal. The selection of Robert McCloskey’s Journey Cake, Ho! (1953) might also be surprising to some. McCloskey won two Caldecott Medals for his illustrations in Make Way For Ducklings and Time Of Wonder, and Caldecott Honors for Blueberries For Sal, Journey Cake, Ho!, and One Morning In May. McCloskey collaborated with his mother-in-law, Newbery Medalist Ruth Sawyer, who authored Journey Cake, Ho!. It is difficult to find in first edition. Referring to the original article in this series, I rated each book across eight different, but related factors. The chart, above, provides a single line summary of the rational for the book’s selection of the ‘Nearly No Brainers’, a simple topline synthesis of the ratings. There is a natural progression from beginning illustrator to established illustrator within the children’s book market (i.e. the book publishing industry). Illustrators follow a similar progression within the collectible book market. However collectors should realize that an illustrator’s success in the publishing industry is not synchronous with ‘success’ in the collectible book market. It often takes years and years of success in the publishing industry before the illustrator is recognized as a collectible in the secondary (i.e. used) book market. Michael Hague’s illustrated books have been successful in the primary book market for decades, with over a hundred books published embellished with his illustrations. Hague illustrations have garnered some minor awards, however he has not been given a major. Even with this commercial success, in the secondary/used market not all children’s booksellers make trade in Hague’s first editions, and very few general booksellers do. Stephen Gammell is not as prolific as Hague, however his book illustrations from the 1980’s garnered a Caldecott Medal and Honor award. Most collectible children’s booksellers would make trade with his award winning books, and many would make trade in first editions of Gammell’s non-award winning books. However, because of their modest value and narrow collector interest, very few general booksellers would make trade in first edition Gammell’s Caldecott books. Leo Politi won a Caldecott Medal and Honor award in the 1940’s. Even though Politi and his books did not cross over into pop culture, most collectible booksellers, both children’s book specialist and general booksellers, would make trade with his award and non-award winning books. The reader might ask why do general booksellers have an interest in Politi books but not Gammell books, when their credentials are so similar? Within any specialty category, such as children’s books, general booksellers must know the book or illustrator has sustaining value within the market. The bookselling generalist cannot afford to invest the research time in the category that the specialist invests. Before deciding to carry the book in their inventory, the bookselling generalist needs to experience years and years of consistent demand for the illustrator or the books. This assures the bookseller there is stable demand, and eventually will risk their capital toward carrying the illustrator’s titles in their inventory. On this website the primary audience is the children’s book collector and the collectible children’s bookseller, groups which do invest research time into the category. As such, we identify books and illustrators before they are widely accepted as ‘collectibles’ by generalist booksellers. Rising Collectible (6) Illustrators who have several books published, and have measured success in the marketplace, but have not yet garnered major awards or received critical acclaim. Often their books are modestly priced relative to their body of work. Their books are recognized as collectible by many astute children’s booksellers. Choice Collectible (7) Reserved for illustrators whose books have been published for several years, and their books endeared by the public and been very successfully sold. Their books might have received a prestigious award. Their books are recognized as collectible by many children’s booksellers. Highly Collectible (8) Reserved for illustrators whose books have been published for several years, perhaps decades, and their books endeared by the public and been very successfully sold. The illustrator, and their books, might have received prestigious awards, and several books might have crossed over into pop culture. Their books are recognized as highly collectible by children’s booksellers. Prestige (9) Reserved for illustrators whose books have been published for decades, and their books have been endeared by the public and sold millions of copies. The illustrator and their books have received prestigious awards a number of times, and several books might have crossed over into pop culture. Their books are recognized as fine collectibles by children’s booksellers and many general booksellers. Luminary (10) Reserved for illustrators whose books have reached the highest level of collectibility. These creators have been published for decades, and their books have been endeared by the public and sold millions of copies. The illustrator and their books have received prestigious awards a number of times and several have crossed over into pop culture. Their books are recognized as fine collectibles by general booksellers. These illustrators have had a meaningful impact on society in a manner outside of general book selling or publication. 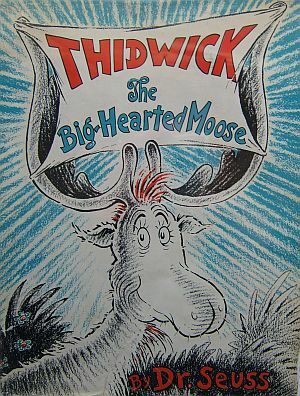 While Dr. Seuss, Maurice Sendak, and Chris Van Allsburg are the only three illustrators to recieve the Luminary designate, those receiving a 9 is nearly as select, a group which includes Tasha Tudor, Lois Lenski, Wanda Gag, Robert McCloskey, Crockett Johnson, Shel Silverstein, Eric Carle, and H.A. Rey. The next article in the series will continue to build the list of Top 100.